As I chewed on the above quote these questions fell like assembly line parts in my thoughts. What defines its full development? As is my habit of late…I asked those questions…search my own resources for answers and then approached my Heavenly Father, handed Him my “paper” and asked Him to “grade” it…then He tudored me in the correcting, teaching, redefining and settled my heart in what for now He would like me to stay firm on. I say for now, with emphasis on now, because He never stops expanding and developing truth in me. As I live He often settles me where I need to put to action a lesson, but later will move me again in correcting, teaching, redefining, refining that which He began at another “point in time”. Character is a constant state of development. Character is defined by a Who not a what. Character is Lived not a theory to adopt. Its structure is taught to the mind/heart; but its built on the movement of actions taken based on what He teaches. God is Honesty/Truth. His person, nature, and every action He takes personifies this truth. As the Master/Maker/Origin of Honesty He alone can teach what its actions look like. He may teach, don’t cheat. Cheating is anything that says you know something you don’t, have something you don’t, don’t have something you do and so on; and making out for your advantage the implication of that which is untrue. Its lying, albeit rather indirectly at times. Often called a “little white lie”. Often explained by saying, “Well, its not all a lie.” Or explained as okay because one must protect themselves by doing so. Or excused because a greater authority “cheats” so “now you have to” to keep from being cheated. (I.E. cheating on taxes). Adonai (Lord), I know the way of humans is not in their control, humans are not able to direct their steps as they walk. Indeed, what will it benefit a person if he gains the whole world but forfeits his life? What could a person give in exchange for his life? For if someone is ashamed of Me and of what I say in this adulterous and sinful generation, the Son of Man also will be ashamed of him when He comes in His Father’s glory with holy angels. So, since we have come to be considered righteous by God because of our trust, let us continue to have shalom (peace/completeness) with God through our Lord, Yeshua the Messiah. Also through Him and on the ground of our trust, we have gained access to this grace in which we stand; so let us boast about the hope of experiencing God’s glory. But not only that, let us boast in our troubles; because we know that trouble produces endurance, endurance produces character, and character produces hope; and this hope does not let us down, because God’s love for us has already been poured out in our hearts through the Ruach HaKodesh (Holy Spirit) who has been given to us. If you are a virgin, the only way to “keep it” is to remain sexually pure. Once you loose it, it can not be “brought back”. The profoundness is obvious, it is easier to keep virginity than to recover it! Because once it is lost, there is no going back. Though keeping it may not be easy; compared to the toil of attempts to “recover” it – keeping is a cake walk! Likewise, the Commandments of Character, God gave by speaking, teaching, directing at the beginning. Then He gave them “character development time” in action…to prove the statement above. Its a whole lot easier to refrain from lying than to lie and try to regain trust. 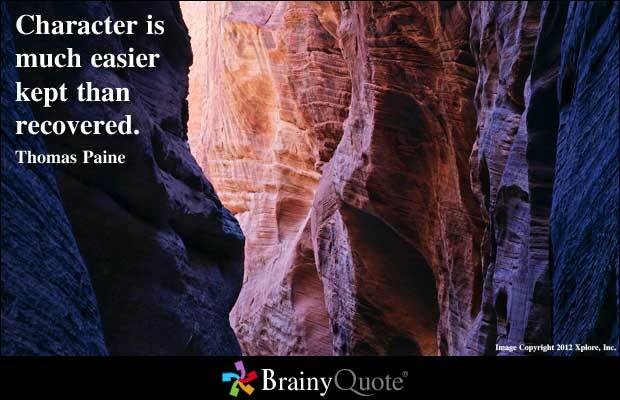 Not easy to do always but the alternative is harder! Again, a lie cannot be undone. Only exposed and repented of. Recovery of integrity is much harder work than the hard work of keeping it. We start with “A’s”; keeping them is never easy, but easier than bringing the grade back from an “F”. The Word of God and His ways are very elementary in concept. I praise Him for this!! Very well said. Once again this is a very timely, and much needed posting for us all. 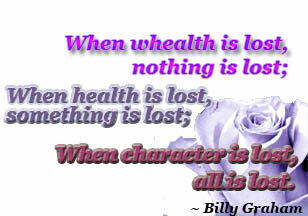 How true it is that our character is worth more than all the riches this world has to offer. When we take a stand for Christ, seek to display His holiness, our character is a major part of this. That is why we ALL need this very important lesson. Thanks again for your faithfulness in doing what the Lord has called you to do. You are a blessing to many. Lord bless. This is an awesome post. 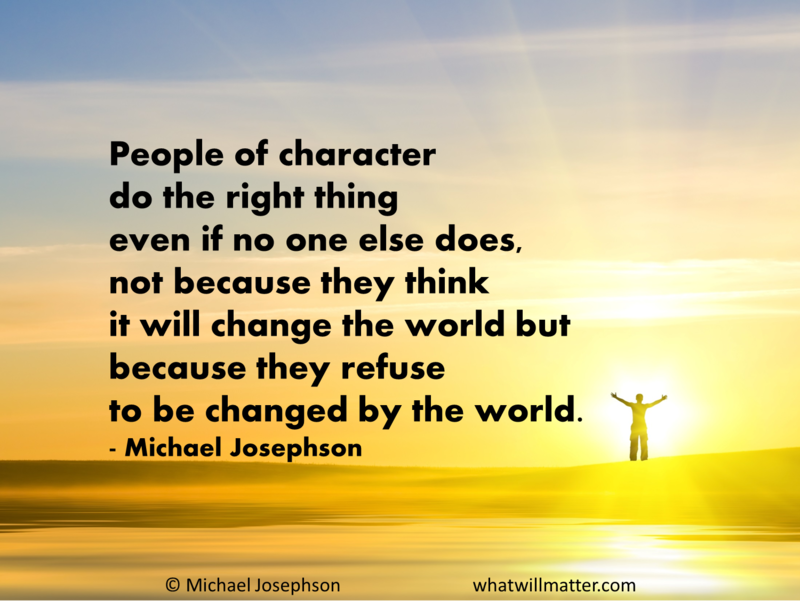 Our character is so important. When we are believers, we are to look like our LORD. Sadly, we make one bad choice and loose our good character. Great reminder to make good choices and not endanger our good character. Thank you! Many blessings to you dear Sister Toni!! Glory and praise to Him who holds us each in the hands of His Character…by the work of a Jewish Craftsman! !